First step: Step one: use a small knife to cut the stem off the top of the pumpkin. You’ll want the hole large enough to fit your Styrofoam block. I had to cut my Styrofoam quite a bit to fit inside. Use hot glue to secure the block inside. 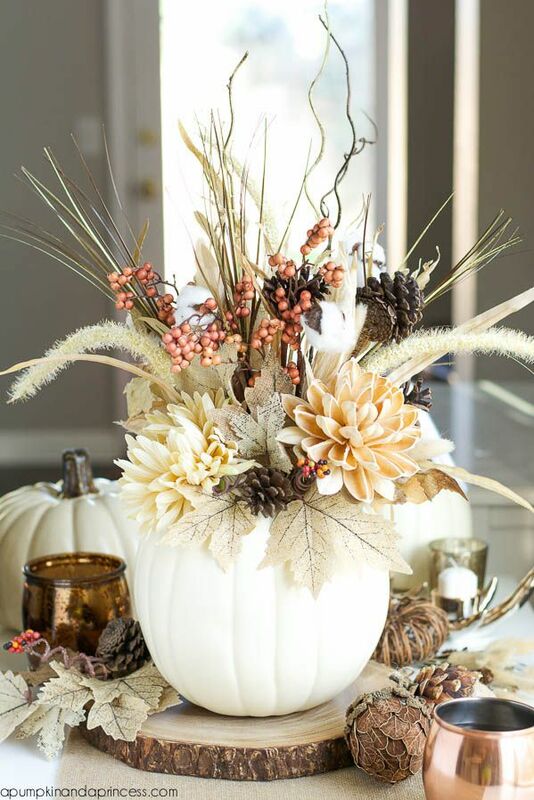 Second step: begin filling your centerpiece with fall stems. To be honest I’m not very familiar with flower arrangements, I just went with the flow and hoped it would look decent when I finished. I did use a few tall stems (the faux branches) in the center to give the vase arrangement some height. Once those were in place I added a fall foliage bundle (the orange flowers, cotton branches, and pinecones were all one piece). I used that as my main filler then used smaller pieces to fill in the gaps. A few of the pieces I used were from the naturals section at Michaels. My favorite is this beautiful wood flower. Isn’t it gorgeous? Lightly soak a 10- or 12-inch ring of Oasis floral foam in water. 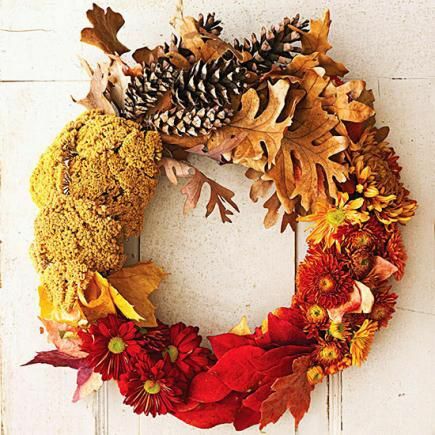 Group your materials by color to plan each section of the wreath, and then insert materials by the stems. We used tree leaves and fresh mums for red and orange bands of color, tree leaves. and dried yarrow for gold, and dried oak leaves and pinecones for brown. Hot glue or T-pins help hold materials in place.